You know that summer side dish you just always make. It doesn’t matter how many times you make it because your family never gets sick of it? That’s my Bacon Cheddar Potatoes. They’ve changed to become easier and easier over the years. It’s pretty simple to throw together. 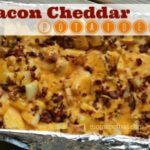 You just need some red potatoes, an onion, garlic, olive oil, bacon pieces, cheddar cheese, and a dash of salt and black pepper. Preheat your oven to 450 degrees. First take the red potatoes and wash them well. Then with the skins still on cut them in half and then half again and slice. I make them into large bite size but don’t make then too thick because it will take them longer to bake. Then slice your onion so it stays in long strips. My kids appreciate being to eat around them. Adding them in is really worth the extra flavor. Add the onion and potatoes to a bowl and add in olive oil and your garlic minced. Use your hands to combine them all. You want just enough oils to lightly coat everything. 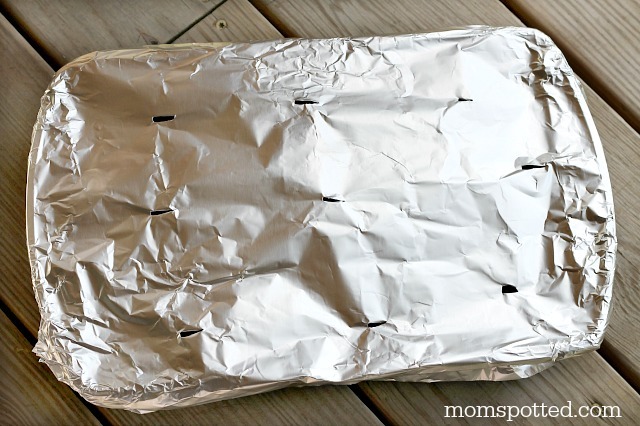 Take a 9×12 baker and line it with tin foil. You will thank me later when cleaning the pan is a breeze. Then take your mixture and layout in pan. Cover with additional tin foil and make 9 slits in it. Place in oven for 45 minutes. Then remove tin foil and check potatoes. They should be almost cooked but slightly hard if you were to try one. Sprinkle with a handful of bacon pieces and salt and pepper to taste. Bake uncovered for an additional 25 minutes. 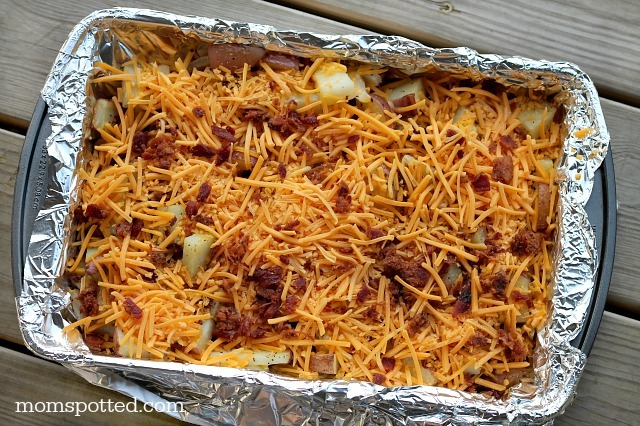 Once fully cooked remove and add cheese and remaining bacon pieces. Bake uncovered for 5 minutes. Or until cheese is completely melted. It will look like this when it is done. Try not to drool. I usually want to run away with the pan and a fork but the guys in this house would just chase me anyways. If you switched to a disposable baker you could even cook these on the grill! Either way I promise your family will love them! 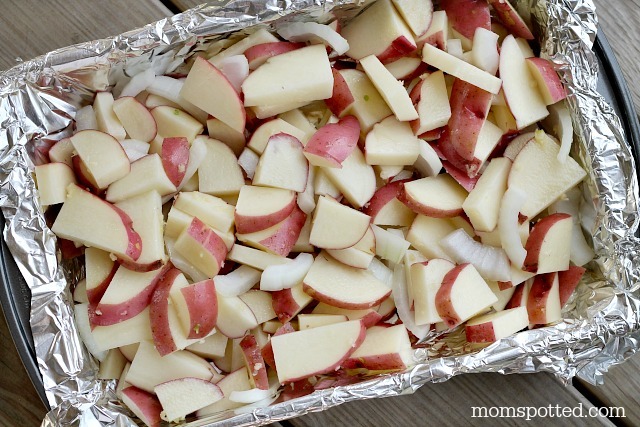 A great side dish every one will love! Preheat oven to 450. 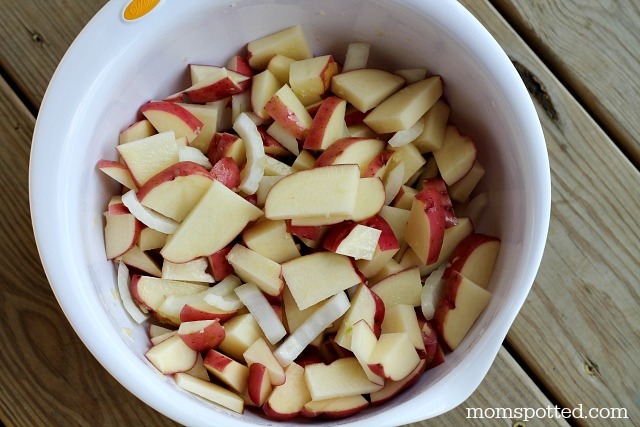 Cut up potatoes and onion and combine in bowl. Add minced garlic cloves and olive oil. Bake covered for 45 minutes. Add slits to cover. After 45 minutes remove cover and add half the bacon pieces and add salt and pepper to taste. Bake an additional 25 minutes uncovered until soft. Remove and add cheese and remaining bacon pieces. Bake 5 minutes or until cheese is melted. Serve. Wow this looks absolutely delicious! I JUST bought these potatoes from the produce market and was planning on making it for dinner, but never thought of bacon! Mmmmm, these look incredible. My husband already wants to make them for our annual picnic. Thank you for sharing. Oh wow, these look delicious. I am so making these. Add a dollop of sour cream and yum! These look wonderful! 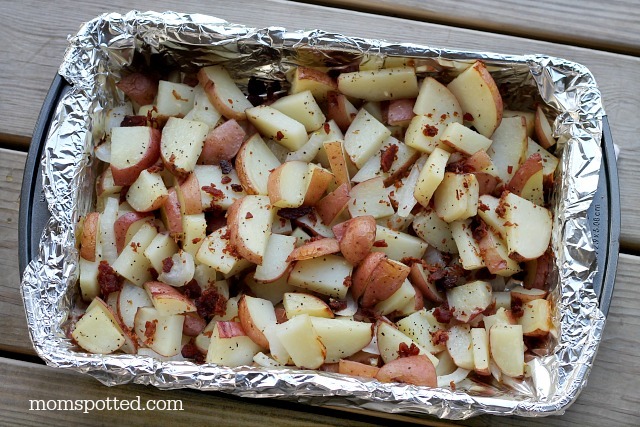 We love red potatoes, so I am always looking for new ways to prepare them. I am adding this to our menu for next week. I don’t know what we will have with it but that doesn’t matter. Thanks for the recipe! Ermagoodness, those look good. I’ll be adding potatoes to my shopping list. That looks easy to make and yummy! That’s a recipe I would super duper love. 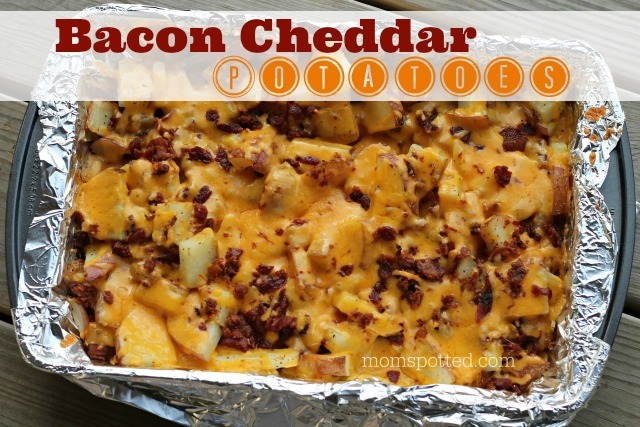 Potatoes, cheese and bacon…it has it all. I love how easy this recipe is to pull together. Yeah Im SO making those tonight. I need these in my face, straight-away. 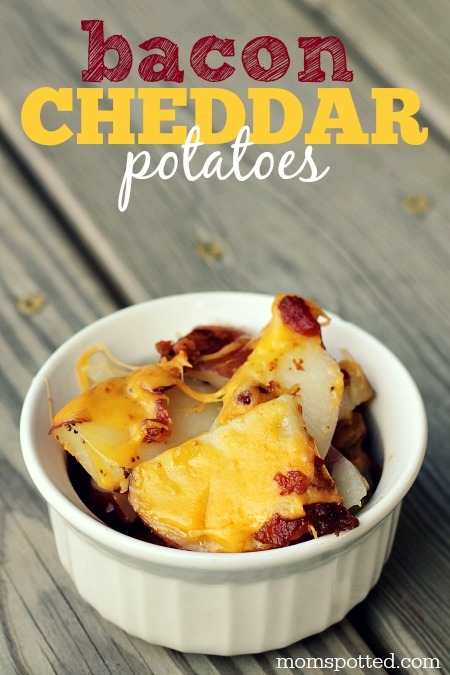 These remind me of the bacon-cheddar crock pot potatoes we make (recipe’s on my site). My husband knows how much I love them so he makes them on special occasions. I don’t think I’ve ever had a spanish onion before, though! Yum! Anything will a little cheese and bacon will be an istant hit. Wow, these potatoes look amazing. I would love to try these. Oh those sound amazing! 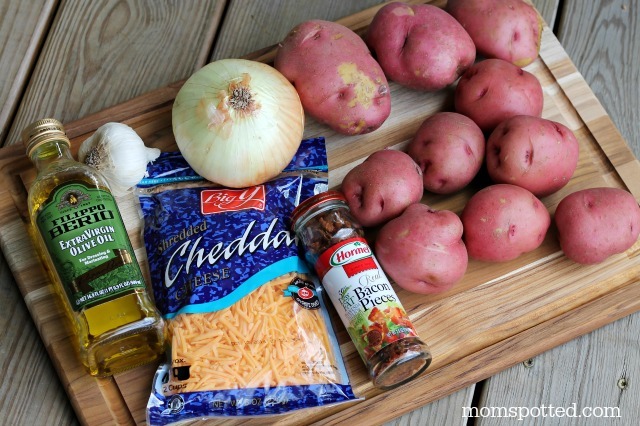 I need to make these- nothing better than cheese on potatoes! I love the simplicity of this meal yet what a crowd pleaser! These look delicious. I also like that it’s relatively easy (thank you!). This would be perfect for a picnic too. This looks so yummy. Fairly easy to make and I am sure it tastes great. These look decadent and something my family would love! My “go-to” dish tends to be quiche but we’ll have to give these a try. Those look delicious and I am sure they would be a HUGE hit here!! 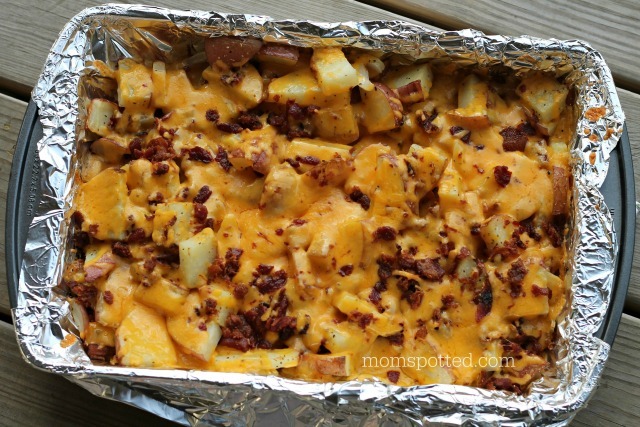 Looks delicious, who doesn’t love cheesy bacony potatoes! my dad would love this for breakfast!! 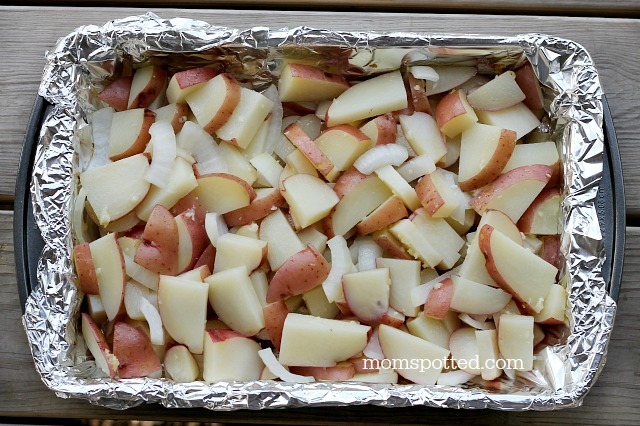 These potatoes sound delicious, definitely the perfect side dish.